The United States, Mexico, and Canada have forged a massive trading and production network over the past three decades. The North American Free Trade Agreement (NAFTA) opened the doors for a significant reorientation of all three economies. Combined, Canada and Mexico are the US’ largest economic partners and the US is by far the largest economic partner for Mexico and Canada. Up to 14 million US jobs depend on NAFTA trade; likewise, US trade and investment supports millions of jobs in Mexico and Canada. Trade between the three countries now amounts to 1.3 trillion USD a year: over 80 percent more than China-US trade. The Mexico-US relationship has undergone a major transformation during these years. Bilateral trade is six times its size before NAFTA existed, reaching 616 billion USD in 2017, and the nature of trade changed from traditional commerce to intra-industry and intra-firm trade. The two countries became joint producers instead of merely traders and greatly expanded cooperation across a wide range of issues. Debate about whether to ratify the new agreement, called the USMCA (the US-Mexico-Canada Agreement) in the US and T-MEC (Tratado México-Estados Unidos-Canadá) in Mexico, will be lively in the US Congress. The prospects for rapid ratification are low. This paper explores the background, substance, and outstanding issues regarding the new North American trade agreement from the US-Mexico perspective. NAFTA was negotiated from 1990 to 1993 and entered into force on 1 January 1994. At the time, it was the most modern and progressive trade agreement in the world. Before NAFTA’s signature, there had not been a trade agreement as broad in coverage and as deep in mutual commitments. NAFTA became a model to help update the multilateral trading system in the GATT’s Uruguay Round (1986-1994) and for subsequent free trade agreements. For the United States, NAFTA was a way to embrace its southern neighbor, as well as to open new markets for US products. The United States had already concluded a trade agreement with Canada, and President George W. Bush and key cabinet members wanted to overcome the heritage of a “distant” relationship with Mexico that had characterized US-Mexico interactions. For the US, this was part of a broader restructuring of international relationships following the collapse of the Iron Curtain. For Mexico, NAFTA was a way to attract foreign investment, to increase the rate of economic growth, and to generate new jobs through exports. For Mexico, NAFTA was a way to attract foreign investment, to increase the rate of economic growth, and to generate new jobs through exports. In the 1980s, Mexico had experienced poor economic performance and a loss of international investor confidence. Mexico’s average GDP growth was barely above zero for much of the decade. Following this, Mexico’s government decided that it needed to offer assurances to provide security for foreign investments and to gain guaranteed access to the massive US market. While Mexico’s government considered other options for expanding trade, it concluded that a NAFTA negotiation was the best way forward, recognizing the power of geography and the existence of a friendly administration in Washington. How Well has NAFTA Worked? If one looks at the goals of promoting trade, investment, and the implementation of transparent and stable rules, NAFTA has been enormously successful. Trade between the three countries increased from just over 300 billion USD in 1993 to more than 1.3 trillion USD in 2017; that is a jump of some 390 percent. To illustrate, US trade with NAFTA exceeds trade with the entire European Union and almost doubles that with China. US trade with Mexico has grown six times its size since 1993. It now totals more than US trade with all of the BRICS (Brazil, Russia, India, China and South Africa). Mexico trades more than one million USD a minute with the US. It is the US’ second largest export market and the first or second largest export market for some 28 states. Mexico sells about 80 percent of its exports to the US and has developed highly sophisticated export sectors, including vehicles, electronics, machinery and medical devices. With NAFTA, cross-border investment also boomed. Mexico attracted investment (FDI) from the US and other countries through improved practices and by guaranteed access to the US through NAFTA. In 2015, Canada and Mexico had FDI valued at 388 billion USD in the US, and the United States’ FDI in Canada and Mexico was valued at 452 billion USD. In 2016, the US had 88 billion USD of investment in Mexico, and Mexico had 17 billion USD in the US. Under NAFTA, the private sector built regional production networks, covering automotive, petrochemical, aerospace and other manufactured goods. The countries of North America do not only trade with one another: they produce together. A 2010 study found that there was by far more US content in US imports from Mexico and Canada than from any other country in the world. Mexico led the way with the 2010 study estimating that a finished manufactured good from Mexico arriving in the US had on average 40 percent US content. Some 50 percent of NAFTA trade is estimated to be intermediate goods. NAFTA contributed to a reorientation of all three economies, with positive and negative effects. For example, NAFTA opened Mexico to US agricultural products, which contributed to the massive migration from rural Mexico to cities and to the US. It also spurred modernization of Mexico’s agricultural sector, which now has significant vegetable and fruit exports to the US, while Mexico remains the third largest agricultural export market for US farmers. Some US manufacturing jobs were shifted to Mexico. However, overall many more US jobs are now supported by US-Mexico trade than was the case in 1993. A 2016 study found US-Mexico trade supports some five million US jobs, compared to estimates of only 700,000 jobs in 1993. The debates surrounding the effects of the agreement have been passionate, but not always well-founded. Critics often incorrectly attribute the ill effects of technological changes and the rise of China as a global manufacturing power to NAFTA. What do Mexicans, Americans, and Canadians say about NAFTA? Contrary to conventional wisdom, there is broad support for NAFTA in North America. According to a 2012 survey, 76 percent of Mexicans consider that it has benefited the country; in the most recent similar survey (2016), the responses show a majority in favor of international trade and investment. In the US, the Pew Research Center found 56 percent viewed the agreement as positive for the country in 2017 while for the last 20 years, approximately 75 percent of Canadians have favored free trade in North America. The Chicago Council on Global Affairs has been tracking US opinion of NAFTA since 2008: Between 2008 and 2018, there was more than a 20 percent increase in positive views towards NAFTA, with 63 percent of respondents agreeing that it is good for the US economy. From an economic perspective, the agreement needed to be modernized. Sectors such as electronic commerce were not included in NAFTA and other areas needed to be updated, for example, expanding the coverage of trade in services and protection of intellectual property rights (IPR). In the more political arena, NAFTA’s environmental and labor side letters needed to reflect the higher levels of commitment in more recent trade agreements. US labor unions and their supporters in Congress argue that Mexico should adopt and implement higher labor and environmental commitments to create a “fairer” trade relationship. In 2012, Mexico and Canada joined the US and others in the negotiation of the Trans-Pacific Partnership (TPP), which the three governments viewed as a way to update and expand coverage of all areas needing improvement in NAFTA, as well as expanding the number of countries that would adopt the new commitments. While a TPP agreement was reached, in January 2017, President Donald Trump pulled out of it. President Trump had also campaigned with promises to renegotiate NAFTA or withdraw from it. This new US stance led to a formal renegotiation of NAFTA, which began in August 2017. Agreement on a draft text was reached at the end of September 2018. Leaders of the three countries signed the draft agreement on 30 November 2018. What Were the Most Controversial Renegotiation Issues? The rules of origin specify the characteristics that goods have to be traded in the North American region without paying a tariff. If goods are entirely produced in the region they enjoy preferential treatment, but for externally produced components, the percentages of regional content that allow a good to be considered “North American” are established in the rules of origin. For the automotive sector, NAFTA established a regional value-added rule of 62.5 percent of total content. Under the USMCA, this percentage increases to 75 percent, of which 40 percent must come from locations that pay at least 16 USD per hour in wages. There is also a new requirement to use steel and aluminum produced in the region. US trade with Mexico has grown six times its size since 1993. The negotiators sought to strike a balance: If the regional content requirements were very low, there would be low incentives to invest in the region; if the requirements were too high, the rules could break up the existing production chains. Also, given the complexity of the new system, companies could choose to operate under the US’ World Trade Organization (WTO) commitments, whereby the companies would pay only a 2.5 percent tariff, rather than comply with the new North American rules. The United States threatened to use a “national security” rationale to impose higher tariffs on autos, which would serve to press companies to use the new USMCA rules. Foreseeing this possibility, Canada and Mexico included provisions in the USMCA allowing them to export a certain volume of cars to the US, even if the US imposes national security tariffs. Nevertheless, a number of experts argue that the new rules could make auto production less competitive in North America and globally, increase prices for domestic consumers, and cost jobs in all three countries. Regarding Mexico, Florida farmers requested that the US impose limits on Mexican tomato exports when US producers were in high production phase. Mexico successfully resisted these demands. With regard to Canada, the US focused on Canada’s complex production and price control system in dairy. Both the United States and Canada claimed victory, but several studies estimate that any increased US dairy exports will be marginal. Chapter 11 of NAFTA established a dispute settlement mechanism between foreign investors and the State. The US negotiators wanted to eliminate it, in part arguing that the chapter encouraged US investment in Mexico rather than in the US. American businesses argued that this reasoning was flawed, with the energy industry, for example, pointing out that energy investment in Mexico could not take place in the US and that they needed the protections afforded by this mechanism. A compromise was achieved whereby US investments in energy, infrastructure, and telecommunications will remain covered by the agreement’s dispute settlement, but auto manufacturers and others will not have the protections they enjoyed under NAFTA. Chapter 19 of NAFTA allows for a bi-national panel to review determinations of each of the countries regarding unfair trade practices: dumping and subsidies. This is very important for Canada and Mexico because they see it as a restriction to the ability of the US to impose tariffs or quotas to combat allegedly unfair practices without the decisions being properly justified by law or based on adequate evidence. This mechanism is retained in the new agreement. Chapter 20 of NAFTA relates to dispute resolution between governments about the interpretation and application of the agreement. This mechanism has not worked particularly well because any country can block the establishment of a panel. It was agreed to leave the mechanism unchanged; in other words, decisions are binding, but any party can still block the establishment of panels. Contrary to conventional wisdom, there is broad support for NAFTA in North America. The so-called “sunset clause” arose from a US proposal that the new agreement should automatically expire at the end of its fifth year, unless the three countries agreed it should continue. Canada, Mexico, and business associations vigorously opposed this proposal because the main objective of NAFTA is to provide certainty to investors, exporters, and importers through stable and clear rules. It was agreed to give the new agreement a minimum life of 16 years, and in the sixth year the three governments would meet to determine whether an additional period of 16 is provided, and so on every six years. 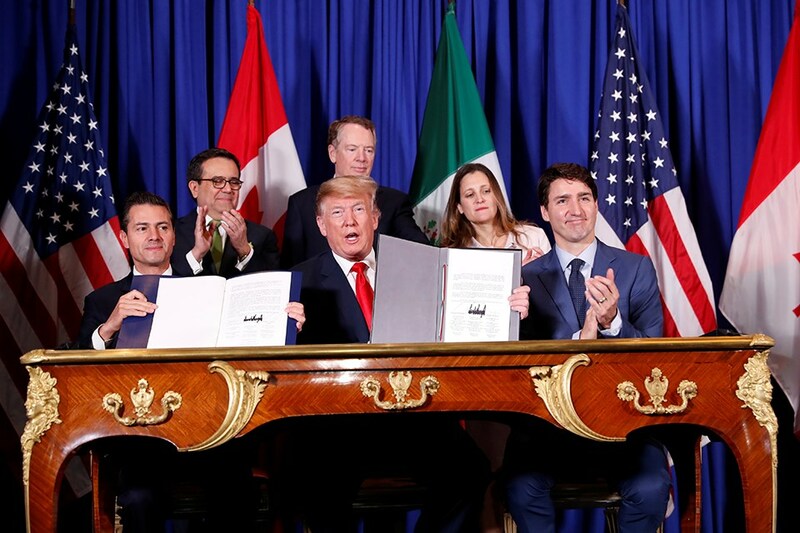 Is the USMCA a Better Agreement than NAFTA? US, Mexican, and Canadian business and farm organizations welcome the new agreement because it preserves much of NAFTA and would restore certainty to the North American market. In Mexico, then President-elect Andres Manuel López Obrador (AMLO) was pleased with the outcome. He is believed to support the agreement in part because it will provide certainty for some 80 percent of Mexico’s exports and allow him to focus on domestic reforms in Mexico. He also insisted on a weaker energy chapter in the agreement, which assures Mexican sovereignty in that sector. It used NAFTA as a basis for negotiations, taking advantage of what had worked well since 1993 and incorporates modernization proposals agreed by Mexico in the TPP negotiations. No new tariffs or quotas were introduced. The trilateral agreement was maintained. An agreement was reached in a reasonable time, and reflected the collaboration of the outgoing and incoming Mexican administrations. The agreement provides stable rules for at least sixteen years. It is still difficult to update the agreement, which may be even more important as the three economies face waves of new technologies that will likely transform industries. The auto sector rules of origin may prove too costly, complex, and restrictive making the industry less competitive. The same may be true for new textile industry rules. Dispute settlement mechanisms were weakened. A new clause regarding notification of possible agreements with non-market economies may restrict the autonomy of trade policy for Mexico and Canada. Nevertheless, the bottom line for Mexico and for many stakeholders in the US and Canada is that the USMCA provides a workable framework for regional trade and investment. What are the Ratification Prospects for the USMCA? Canada and Mexico both want the US to lift tariffs put on their steel and aluminum exports to the US during the negotiations before the USMCA goes into effect, but legislative approval does not appear to be a major hurdle at present in either country. The main challenge is that the Democrats now control the US House of Representatives and will likely be reluctant to grant a “victory” to President Trump. At a minimum, they will demand additional concessions in the form of stronger enforcement of labor and environmental commitments. Some are also expressing opposition to provisions they say will raise drug prices for consumers. On the conservative side, some are asking for the deletion of sexual orientation provisions and stronger protection for US investments in Mexico. On 8 February 2019, the US administration submitted to Congress a relatively short list of laws that will need to be changed under the USMCA. Economic analyses estimate significant costs for all three North American economies if NAFTA were ended. Pundits are divided about the prospects for US ratification. Though the business and agricultural sectors are pushing for ratification, the Democrats may opt to delay. President Trump has threatened to withdraw from NAFTA if Congress does not approve the USMCA. If the President were to announce a withdrawal from NAFTA, congressional Democrats would likely challenge in court his right to take such action unilaterally arguing that NAFTA is a mixed Executive-Congressional agreement. What Would the Costs be of a US Withdrawal? Economic analyses estimate significant costs for all three North American economies if NAFTA were ended. Job losses are estimated to range between 1.4 to 4 million for the US, 1.5 to 10 million for Mexico, and 0.5 million to 1.2 million for Canada. Medium-term GDP losses and trade declines are also estimated to be significant, while China, Korea, Japan, and Germany would benefit. On the other hand, one study of the US-Mexico border economy suggests that there would be significant gains in jobs and GDP in both countries with the kind of additional economic integration that could come under the USMCA. What if NAFTA Remains in Effect? Until a political consensus is achieved in the United States, the continuation of NAFTA would be acceptable to Mexico, as well as to Canada and US stakeholders. However, politics in the US seem tilted toward either a new agreement or scrapping NAFTA. Mexico’s legislature is currently considering a major labor reform aimed at creating a new system for labor and union rights which may well address some of the concerns raised by US unions and Democrats in Congress. AMLO has been a champion of improved wages and working conditions, but the Mexican government opposes re-opening the negotiations. Mexico and Canada are seeking to expand trade with others as a way to reduce dependence on the US market. But trade diversification will only provide limited relief in the foreseeable future. The key to continued economic prosperity for Mexico and Canada is a positive and expanding economic relationship across North America. The US also has much to gain from sustaining and strengthening its North American economic partnerships for the global economic competition ahead. Geography is destiny for all three North American neighbors. Alan Riding, “Distant neighbors: A portrait of the Mexicans,” (Vintage, 1984). Francisco Sandoval, “US- Mexico Trade Relationship under NAFTA: Modernization and Opportunities,” https://naftamexico.net/naftaworks/presentations/US-MXTradeRelationshipAUG2018.pdf, Plate, 8 August 2018; Holly K. Sonneland, “Chart: NAFTA by the Numbers in 2017,” 1 March 2018, https://www.as-coa.org/articles/chart-nafta-numbers-2017. Christopher Wilson et al., “Charting a New Course: Policy Options for the Next Stage in US-Mexico Relations,” March 2017, https://www.wilsoncenter.org/sites/default/files/charting_a_new_course.pdf; United States Census Bureau, “Foreign Trade - Trade in Goods with Mexico” https://www.census.gov/foreign-trade/balance/c2010.html; Bureau of Economic Analysis US Department of Commerce, “International Trade in Goods and Services,” November 2018, https://www.bea.gov/data/intl-trade-investment/international-trade-goods-and-services. Earl Anthony Wayne, “NAFTA needs a facelift, not a lobotomy,” The Hill, 5 June 2017, https://thehill.com/blogs/pundits-blog/economy-budget/336351-nafta-needs-a-facelift-not-a-lobotomy. For a deeper look at the subject, see Ortiz-Mena, “Toward a Positive NAFTA Renegotiation: A Mexican Perspective,” in C. Fred Bergsten and Monica de Bolle (eds. ), A Path Forward for NAFTA, Washington, DC, Peterson Institute for International Economics, July 2017, pp. 24-35. Technically, they have zero tariffs. For most of the goods the system of change of tariff classification is used in order to determine the requirements to obtain preferential treatment; in the automotive sector, the value-added system is used. The requirement is 40 percent for cars and 45 percent for vans. The most-favored-nation tariff is the tariff rate which member countries of the WTO offer to countries with which they do not have a preferential trade agreement. See in this same book the article by Edna Ramírez. This is one of the main criticisms of the T- MEC making Hufbauer and Globerman. The rules of origin for textiles are synthesized in this site: https://globalapparelforum.com/effects-usmca-textiles-explained/; Greg Keenan, “North America’s New Free Trade Agreement: Impacts on the North American Auto Sector,” Wilson Center, 31 January 2019. For investment disputes between Mexico and the United States, USMCA will be used; for disputes between Canada and Mexico, CPTPP, and Canada and the United States will resolve their investment differences using the legal instances available in each of those countries. Antonio Ortiz-Mena is Senior Vice President at Albright Stonebridge Group. He is also an adjunct professor of international economic relations at the CIDE (Centro de Investigación y Docencia Económicas) and the Edmund A. Walsh School of Foreign Service, Georgetown University. He is a member of the Trilateral Commission, and the boards of the Center for US-Mexican Studies at the University of California, San Diego and the Mexico-US Foundation. Ambassador Earl Anthony Wayne is a Public Policy Fellow at the Woodrow Wilson Center for International Scholars and Co-Chair of the Advisory Board of the Mexico Institute at the Wilson Center. Wayne was US Ambassador to Mexico and Assistant Secretary of State for Economic and Business Affairs. He is also currently a senior non-resident advisor at the Atlantic Council and the Center for Strategic and International Studies in Washington, among other affiliations.